Feel enriched and pure with the natural cleansing process of Papaya as this efficient skin formula adds a new dimension to your beauty. - Contains enzyme ‘papain’ which helps whitening and soften our skin. A special herbal formulation contains 'Papain' from Papaya ( Carica Papaya Caricaceae ) which helps whiten and soften your skin naturally. 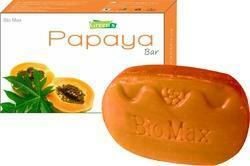 The Silka Papaya Bar Soap is a whitening herbal soap intended for everyday use. Enriched with Papaya Enzymes and vitamin E, this soap helps improve the appearance of skin, making it softer and smoother. We are among the reputed organizations, highly engaged in manufacturing and supplying an optimum quality range of Papaya Body Soap. Enriched with papaya enzyme and blended with tropical herbs to whiten the skin. For cleaner and finer skin complexion, It also eliminates acne on the skin; lighten pigmentation and dark marks such as acne marks, freckles, sun spots and the like. Soap is made from 100% organic herbs. - No animal fat mixing. - Herbal soap is made out of single natural herbs and blended with pure coconut oil. - Our Herbal soaps do not have artificial colours. Royale - Kojic Papaya Skin Whitening Soap With the complete combination of active ingredients, Royale Kojic Papaya Soap helps remove pimples and warts, mildly exfoliates, removes blemishes, nourishes and rejuvenates the skin and lightens overall skin tone.